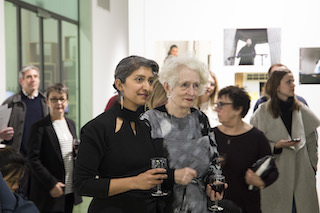 London in March, the beginning of Spring, was the right time to celebrate the new exhibition at the Lethaby Gallery of the University of the Arts London. I hope to soon find the time to post the exhibition with images on the page devoted to that work. 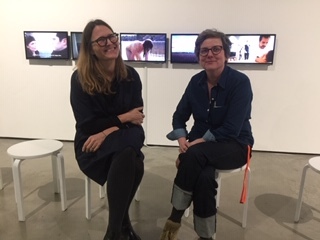 The curators Michaela Giebelhausen and Alison Green, and the gallery director Kate Pelen did a brilliant job. The show officially opened on March 13, and the day after we held three workshops and two lectures. My greatest joy was to be working with Michelle again. I realized how much I have missed working with her. We are plotting and planning for a new collaborative exhibition project. The week after, I returned to London to give two lectures which had been planned last year but fell through due a strike. One was a conversation with the host at King’s College, Luis Rebaza Soraluz, on Doris Salcedo’s work Palempsesto; the other one, the next day, on political art, at University College London, hosted by Maria Chiara d’Argenio. I used the opportunity to have a first session with Michelle about both our new projects, to see how we can bring those together. And right after returning on Friday afternoon, I attended the opening of five exhibitions at the Haags Gemeente Museum. One of these was devoted to the art of Maria van Kesteren. Another was on Vladyslaw Strzeminski and Katarzyna Cobro, heros of the Polish avant-garde. Both these were exquisitely installed. The great bonus was the profound pleasure to link up again with Jaroslaw Suchan, director of the Museum Sztuki in Lodz, where we had the great honor of premiering the Madame B exhibition. But the week was not over yet. Sunday afternoon I held the lecture on Salcedo’s Palimpsesto again, this time in the framework of an exhibition of Colombian art, organized by Framer Framed and What Art Can Do, two organizations in Amsterdam devoted to contemporary art with special attention to its political potential. For those interested in the lecture, I tried to post it here as pdf with the powerpoint images, but the file, with the images, is too large. If you write to my email address mieke.g.bal@gmail.com I will send it to you. I here post the lecture without the images. I would love to meet and chat with you once, but this is really difficult!